(WBEZ) Olivia Pope wears a lot of white. She wears white dresses to inauguration ceremonies or lush white coats while running to and from one fire to the next. If white is a symbol of purity, from merely a quick glance, Olivia's aesthetics tell a story of a perfect, pristine woman. Her clothes should be the reflection of who she is, or who she projects to the world. 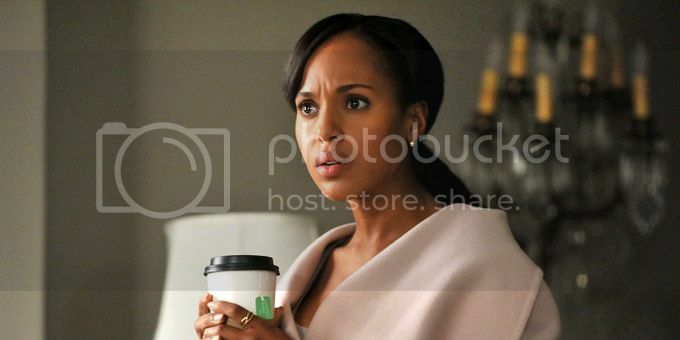 As in real life, Olivia (Kerry Washington) has had and will continue to face situations that test her morals and ideals. And it is the pressure of these decisions that continues to make Scandal one of the most surprising and compelling shows on television. This gradual turn in character continues to breathe life into the show, making it television to unpack slowly the next day. However, what is important in this slow unravelling is not just that the character of Olivia is more complicated and nuanced than we imagined. It's that she is those things at all. [T]he Black Boss Lady is good, or she wouldn't be where she is today. She's not afraid to take some risk if there is a decent chance of a worthwhile pay off … When it comes to drama, her blackness is hardly ever mentioned, her femaleness being the main source of plot. This being so she won't have much of an Urban Accent or have many tropes stereotypically associated with blackness.